Jonah Naturals Mediterranean face wash combines organic aloe, organic herbs, and close to a hundred different minerals from the sea. This remarkable therapeutic facial cleanser is designed to promote repair of a wide variety of skin lesions, including blemishes and discoloration. It's brilliant for ongoing cleansing and nourishment of all skin types, though for those with very light complexion or highly sensitive skin, we recommend using it sparingly. After months of testing, the ladies in my family - including my mom, aunt, and grandmother - rave about what this highly unique face wash has done for their complexion. This is a truly restorative cleanser for all skin types. Vitamin E and rose hip oil are included to help diminish discoloration and repair scarring. A variety of botanicals are included to soothe and renew skin cells and stimulate cellular regeneration. Methylsulfonylmethane (MSM), Decyl Glucoside, Cocamidopropyl Hydroxysultaine, Cocamidopropyl Betaine (from coconuts), Cocamide MIPA, Disodium Laureth Sulfosuccinate, Disodium Lauryl Sulfosuccinate, Acrylates/C10-30 Alkyl Acrylate Crosspolymer, (2s)-2-Amino-5-guanidinopentanoic Acid, Ethylhexyl Glycerin, and Phenoxyethanol. 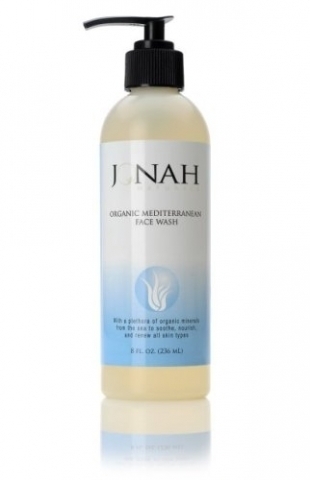 Jonah Naturals Organic Mediterranean Face Wash is produced with no animal byproducts and without animal testing. Directions: Apply on face. Gently massage into skin. Rinse with cool or cold water. Moisturize if necessary. May be used daily. If you're not completely satisfied by the results that you obtain from regular use of Jonah Naturals Organic Mediterranean Face Wash, simply let me know and I'll see to it that you're refunded in full (minus S&H). Comes in an 8-ounce bottle. I have been using this face wash for a few years, and it works perfectly for my normal to dry skin. As soon as I started using it, all hormonal acne and reddish spots that would come and go disappeared. Now, my 16-year old daughter is using mine and has asked me to get her some. It may not work for everyone, but I highly recommend trying it. I have tried so many other face washes over the years, and this one is tops! I have been using Dr. Ben's face wash for several years now on my dry skin. I LOVE it. I also use his organic moisturizing lotion immediately after using the cleanser. Other "expensive" department store products used to make my skin break out, and I wanted to get away from fragrance and toxic chemicals in my face & body products, especially since learning most everything we put on our skin is absorbed into our bloodstream. I am 52 years old and I am so happy to say I look and feel much younger as a result of changing my skincare regime to Dr. Kim's organic products - thanks, as well, to drinking a lot of filtered water and daily use of Dr. Kim's Organic Greens and Vitamin C powder. Sleeping with a humidifier in my bedroom in the cold Chicago winters also helps, too. I've been using this face wash for about 8 months and I really love it. I have rosacea and my skin is always red. This face wash helps the redness considerably. Even my dermatologist complimented me on how good my skin looks! Unfortunately, this face wash was very, very drying to my skin. I have combo/dry skin. Usually I can "make do" with products, but after one wash, I couldn't handle it. My skin immediately did not like it. I have been using this face wash for a few years and do really like it. It does not sting my eyes and takes off all the makeup. I do have to use a face moisturizer afterwards, but that is normal with most facial cleansers. I was skeptical about the skin healing properties of this product especially because it's a cleanser but it does really work somehow! My skin feels so soft and looks clearer than ever! Love it! Although I have been very pleased with Dr. Kim's food products I have used for a long time now, I found that the face wash (was too strong for) my face. Then I looked at the internet site, Skin Deep, that displays the results of ingredient safety testing by the Environmental Working Group. There are several ingredients in the face wash, they consider taboo for absorption by skin, noticeably SLS, to start with. I still love Dr. Kim and his family, and I was 90 years old Saturday. This product is very harsh and dried out my skin significantly, used once for only three days! I once worked out hours after using the wash and when sweat inevitably made its way into my eye, the sting was unbelievable! For my skin, I love Dr. Kim's greens and suggested cod liver oil and I have gone back to just washing my face with cool, soft water. I feel very sorry that I have to give this item such low rating because I like most of the products here. This product is not good for sensitive or delicate skin. I am Asian and have somewhat sensitive skin and I was told that my skin is very thin. At first I thought I loved this product and found my perfect face wash because it cleansed my skin much better than my usual face wash that was too gentle to take care of my acne and blackheads. I didn't even mind the occasional irritation to the eyes. But after a while, my skin started peeling, starting from the forehead. At first I thought I was experiencing allergic reaction to something but soon I realized it's because this face wash has completely dried out my skin even though I always thoroughly moisturize my face after each wash. Every morning I had to peel off some skin because otherwise it's just flaking off like I have some disease. I have stopped using this product and the conditions are much better now. I am very very disappointed. The Mediterranean Face Wash is not as gentle as I would like. I have stopped using it, because it stings my eye area, and my eyes and eyelids remain itchy and red after use. I try not to get it in my eyes, but even the small amount that comes in contact with the eyelids during rinsing is irritating. I believe the essential oils it contains are the cause this irritation. Your face wash is truly amazing. When I wash my face of an evening, all my makeup comes off with just one wash. I don't wear just a little makeup either, I wear the full gamut. The bonus of the face wash is the fragrance, I've never smelled anything so fresh in my life. Now if you can just put the fragrance into a perfume, I would be grateful LOL!!! Peace, Rena.